Terminator Salvation is sure to explode at the movie theater, finally offering moviegoers an in-depth look at the post-apocalyptic world we've all been hearing so much about. But what about the game? Can it shake its movie roots and deliver an experience that is as good as or better than the movie? The third-person shooter takes place between the events of Terminator 3 and the Terminator Salvation movie. 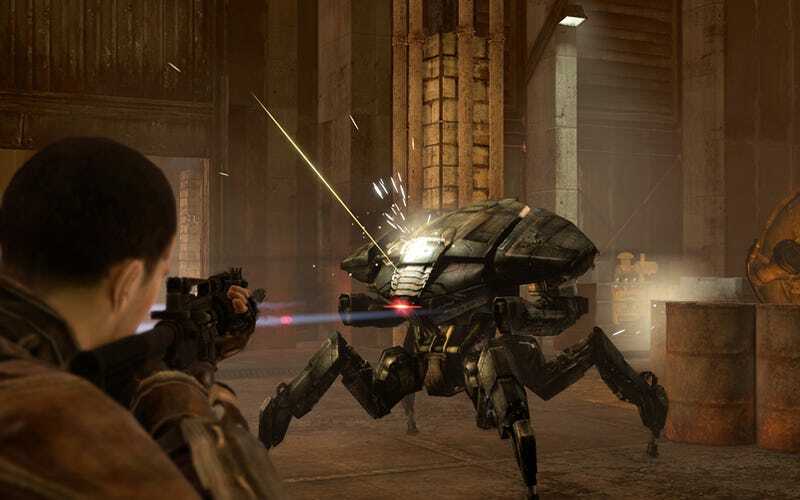 The game has players take on the role of John Connor as he fights his way deep into enemy lines to save members of the resistance left behind. I was shown the beginning of the game and was able to play through a healthy chunk of several levels with Cos Lazouras, president of Halcyon Games, in local cooperative mode on the Xbox 360. The game is set for a release on May 19 for the PC, Playstation 3 and Xbox 360. I was told that development was fairly closed to finished, though the Grin is still adding a bit of polish. Cooperative: With local only cooperative play, the game really needs to deliver on that experience, but the horizontally-split screen felt a bit cramped and the lack of drop-in, drop-out was disappointing. Sizzle: While the game doesn't really have any glaring issues, it also doesn't really have anything that sets it apart from all of the other shooter games out there. It feels like a generic shooter reskinned with a thin veneer of Terminator. Lost: In my relatively brief time with the game I managed to keep getting lost. Support characters tend to run off after you're done and I didn't see any indicators of where to go. What Needs to Stay the Same? Cover System: The game uses an interesting cover system that has you hopping from cover to cover to avoid getting chewed up by the enemies. The system turns hopping into cover and moving between shelter a main tactic of the game. Rail Shooter Moments: Riding on the back of a jeep shooting down living motorcycles was the highlight of my experience with the game. The jeep tilts wildly as your driver zips around wreckage and up embankments, making this segment more challenging than I had expected. Terminator Salvation looks like a playable shooter that will lean heavily on the Terminator name to move copies. I don't see this game winning any awards, and can't expect that I would get much out of playing through the seemingly lackluster title.